Cameron and Osbourne coming under pressure over the reduction in tax credits. Dissenters from within the tories and pressure now from the Sun. 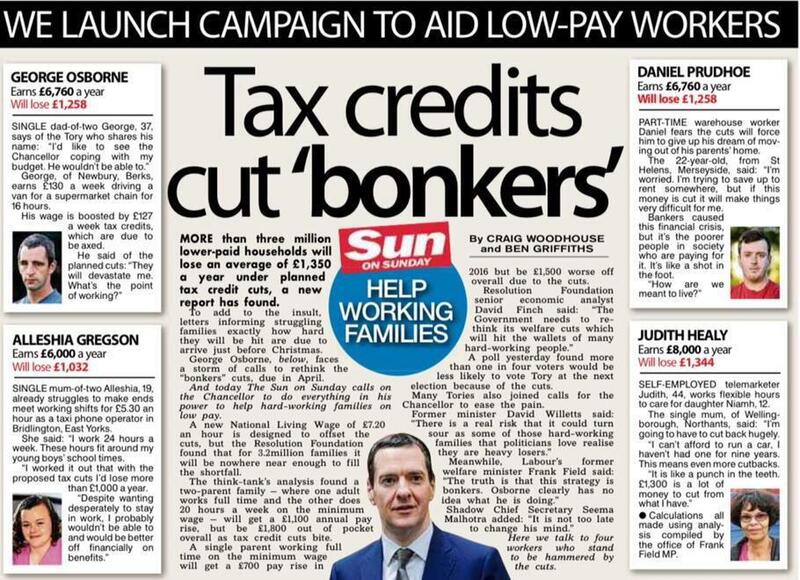 Looks like the Sun won't be supporting Osbourne as next leader , possible they may support BJ. Is that the same minimum wage that 20 years ago the Tories argued was going to cost us millions of jobs? Well, the Tories and their lapdog press see to think what happened 30 plus years ago is relevant when it comes to the Leader of the Opposition. Indeed, they've even gone back to one of his 16 great great grandparents in an attempt to discredit him. The Labour Party is definitely changing, thank god. The Tory party is still the same and will never change: formed out of greed, funded by the greedy, to perpetuate greed. Jeremy Hunt has suggested people in receipt of tax credits must work harder as he said cuts to the benefit send an "important cultural signal" by encouraging a work ethic similar to China and the US. At a fringe event at the Conservative party conference in Manchester, the Health Secretary questioned whether the British were willing to "work hard in the way that Asian economies are prepared to work hard, in the way that Americans are prepared to work hard". I agree with the principle. Tax payers should not subsidise wages, but a decent wage must be paid in the first place. Couldn't agree more, they should delay these cuts until the new 'living wage' fully comes into effect so people dont lose out in the short term. I can see why Osborne is doing it this way round though. It gives them the instant cuts they want towards reducing the defecit. Its early on in a parliament so getting all the 'harmful' things out of the way early is better politically. 4 years from now the benefit cuts will have all happened and they're hoping the increasing living wage, coupled with a growing economy and significantly reduced national debt will give a sense of the feel good factor before the next election. Plus there's the fact that the Tories see many of these low paid workers as either being died in the wool labour voters or ones that dont vote at all so the fall out is likely to be minimal for the Tories electorally anyway. Its a smart move polictically for Osborne & the Tories but not good for the low paid people on the receving end. Mr Hunt why stop with the workers if we're copying the Chinese, when you going to start capping the executive salaries? Whats good for the goose and all that! These are state owned chinese banks though. Once Lloyds is sold off there's isn't that much left they can impose these sort of controls on except through executive pay taxation. Also if they restrict pay at state owned industries then all the best people would just leave to go & work in the private sector. If they impose draconion restrictions on private companies they make them uncompetitive aganist foreign competition which harms the UK economy. Its a bit of a catch 22 situation for UK governments with personal taxation is the only real fair way of dealing with excessive executive pay, but make it too high and staff will go overseas. Hmmm... chickens may yet come home to roost for the Tories on this policy. They did, after all, tell a blatant lie about tax credit cuts in the election campaign and now people who voted Tory are beginning to realise they've been stitched up. I'm it two minds about this woman; on the one hand I'm very sympathetic and can understand her anger at being lied to. However, she chose to vote Tory knowing they had promised £12bn of cuts, but she was happy with that so long as they weren't her cuts. Now it turns out they are and she's not happy. Maybe she should have considered the wider implications of a party's policy rather than her own narrow self interest? The other question about this should come from Labour; why did someone in her position feel she could't support them. If I were her constituency Labour party I'd be trying to secure a meeting with her ASAP to try and find out why she didn't feel she could give them her vote. Doubt it, will be well forgotton by the time people next go to the polls for general election. If not, it'll no doubt be batted away by the new leader of the Conservatives as all being salesmans Daves fault! Because 21 Labour MPs think the Fiscal Charter is just spiffing and the rest march along to Labstain on the Finance Bill. I think you're right, but it's not her fault. Thatcherism and the effect that it has had on subsequent governments and the way the media report social and fiscal policy has created a 'what's in it for me' attitude. A large number of people simply do not look beyond a very self interested perspective, because that's how it's packaged up for them in things like the 'online calculators' on budget day. I genuinely think that Corbynomics, Momentum and the new politics is an opportunity to try and bypass the MSM and challenge this. I think that some of those MPs are going to get a big shock when they have to account for themselves at their next full CLP meetings. MPs, from both sides of the HoC, who rebel against party whips have generally done so knowing they had the support of their local party membership, in this case they most certainly do not. It'll be amazing how the potential loss of their seat will concentrate minds. I'm torn between pity and schadenfreude. If someone like me who is comfortably off, has a good and (relatively secure) job with a good salary can vote for a party that aims for social cohesion and a fair society, even though it may harm my take home at the end of the month. Then why when your situation is not as fortunate as mine, can you vote against this. As Weary Rhino said, she was conned. She was happy that all the lazy benefit scroungers and doleites were getting their booze and fag money taken off them, after all she worked. What she didn't realise was that the tories will only take money out of the bottom, knowing that peoples self interest will see keep them in power. I should thank her because proposed tax changes will benefit me (slightly). I will be able to afford a few more pints each month. The party she voted for have rewarded people in my situation but we will only benefit in a very small way, whereas the cuts to pay for this affect her in a disproportionate way. I don't thank her I feel sick, about it, sick that she thought that way in the first place, sick that she is now facing financial uncertainly and SICK that in 4 years time she will still vote for the same. Fleet Street Fox: Why is anyone surprised that Tories target the poor? FSF in a bit of a rut of "Why aren't the public as smart as columnists" at the minute. I'm in much the same situation... I can comfortably predict a lower tax bill by the end of this Parliament. I actually don't blame the Tories though, they've enough of a track record that only someone who is terminally stupid while earning below average wage would ever think they're going to be better off under them. I do, however, blame Labour. I blame every single numpty in the party who though that promising to be red Tories would work, promising to out-Tory the Tories on welfare cuts, out-Tory the Tories on sucking up to big business and out-Tory the Tories on promising less for the NHS. Seriously, the Labour party had promised to give the NHS less than the Tories, they promised to cut benefits further than them and they promised to be "fairer" to big businesses than the Tories. No bloody wonder Labour didn't win. I blame the Lib Dems for lurching so far right that they should consider themselves lucky to have 8 MPs. Right now, I blame the idiots in Labour like Danczuk who are mouthing off at Labour worse than the Tories are. I blame the idiot MPs who think they can override a democratic mandate in their party across every voting group and bin Corbyn because they know better. I blame the numpties who listen to, and believe, right wing newspapers who seem to be blaming Labour for the Tory cuts. Tories make announcements about ridiculous stuff, Labour opposes it, right wing newspapers blame Labour for what's happening. Then you get idiots blaming "lazy public sector workers" for everything, we've had a few on this board lately. One council has broken the silence on this and shown their government funding cuts since 2010. 58% cuts for Thurrock Council. And planned to be over 99% cuts by 2019. These plans from this year on are well known but are subject to much hush-hush from central or they'll be made worse, some councils can't see how they can be worse and are taking the "publish and be damned" approach. I very much believe in the principle that we should break with the Labour driven benefit dependency culture and instead replace it with a culture that puts great value on work, regardless of the work. As someone who has been in and out of work for five years, unable to secure a permanent job (even though they are around) but typecast as a permanent temp, I know what it is like to have to live off benefits but I don't think it should be easy. It should be something that constantly drives me to look for work - any work. Within my field I have taken on jobs that are menial as well as those that suit my experience. I want to work and I want to earn my money, preferring lower taxes and higher wages to lower wages, higher taxes and a rebate in the form of benefits. I do have sympathy with those who are struggling. I know how it feels to have to count the coppers in my purse. Change is painful but it doesn't mean that ultimately it isn't for the best. Time will tell. One council has broken the silence on this and shown their government funding cuts since 2010. 58% cuts for Thurrock Council. And planned to be over 99% cuts by 2019. These plans from this year on are well known but are subject to much hush-hush from central or they'll be made worse, some councils can't see how they can be worse and are taking the "publish and be damned" approach. Clearly you don't live in St Helens. St Helens Council has never stopped whinging and bleating about The Cuts since the first round of them was introduced. Yet they can afford to buy all the councillors Ipads last year. Amazing really just what councils will waste precious resources on. I have worked for four different local authorities in my lifetime and not one of them was anything like as responsible with their money as any private enterprise I have worked for. One local Council bought everyone brand new computers just a year or so before I worked for them (which I did in 2010). That equated to 800 staff in one building alone. Meanwhile, a couple of years later I took a job with Sainsbury in St Helens and many staff were still using cruddy old cream coloured chunky PCs as they couldn't afford to buy new computers for everyone all at once - they were in profit in those days too. Sure, that is just computers, but multiply that by all the other incidentals and financial benefits attached to working for local authorities and there is still a lot of waste that can be cut to save money.